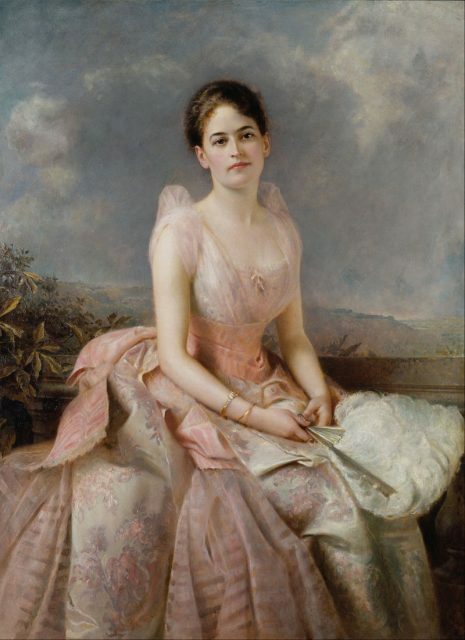 Juliette Gordon Low was a deaf, childless, middle-aged divorcee who could have easily lived out her last years in leisure on her family’s estate in Savannah, Georgia. Instead, she channeled her considerable drive and energy into an organization to help young girls find their own ways in life. 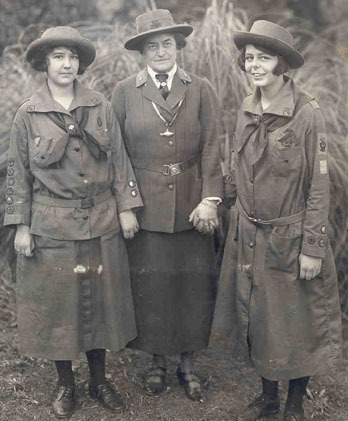 In 1912, “Crazy Daisy,” as some called her, founded the Girl Scouts. And over the past 100 plus years, those girls have become senators, TV anchors, astronauts, and Supreme Court justices, among other high-profile careers. Low benefited as well: She’d come a long way from her past, lonely languishing on a Warwickshire estate while her philandering husband openly cavorted with his actress mistress. 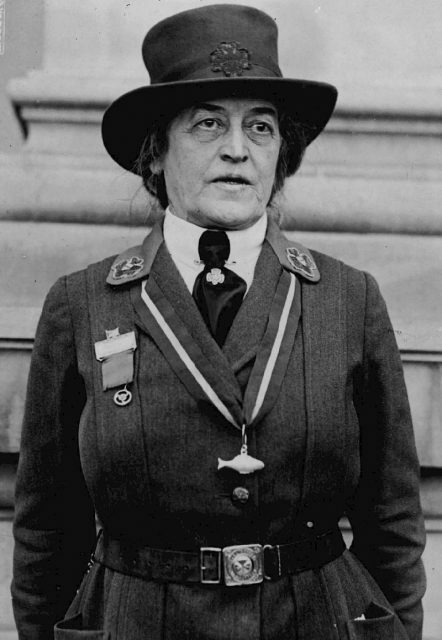 Juliette Gordon, nicknamed Daisy, was born to a wealthy family in Savannah on the eve of the Civil War. Adventurous and eccentric, she came from a long line of spirited women who were both bound by duty but determined to forge their own paths. Her beloved older sister Alice died when Daisy was 20, and the young woman had to take over household duties from her grieving mother. It was during this time that she met and fell for a handsome, rakish ne’er-do-well and son of family friends, William Mackay Low, home from presumed studies at Oxford. His return to England only heightened the girl’s desire. Though her mother disapproved of the match, Daisy couldn’t be dissuaded. After a protracted (and somewhat one-sided) courtship, the two wed in 1886 and moved to England. Daisy had always had ear trouble. She suffered from ear infections as a child, which reduced hearing in one ear. At her wedding, a grain of rice tossed by guests in the traditional bridal sendoff lodged in her other ear, causing an infection. Treatment in those days bordered on barbaric and all but destroyed her hearing in that ear too. She would struggle with deafness for the rest of her life; the effort of trying to understand speech in loud social situations exhausted her. 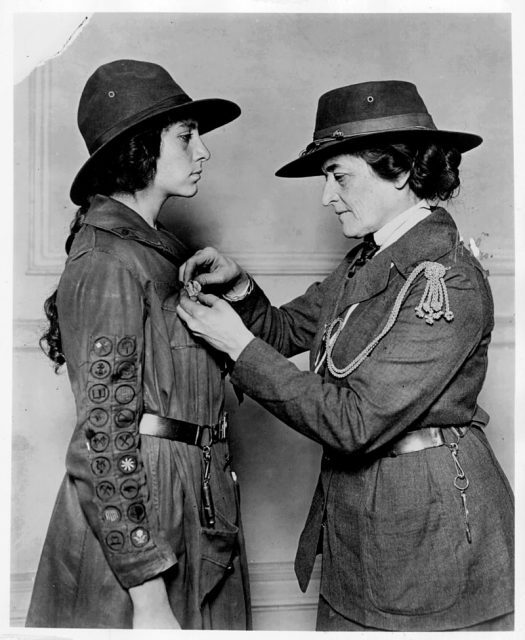 Photo of Juliette Gordon Low in uniform at the 1923 Girl Scout Convention in Washington DC. Daisy’s husband was embarrassed by her awkwardness. Fond of horses, drinking, gambling, and high society, Willy Low didn’t spend much time with his young wife. They rented a house in London for the social season and an estate in Scotland for hunting; he spent the majority of his time in the former, often in the company of other women, she in the latter. Unsurprisingly, they never had children. Though she was depressed, Daisy kept herself busy, painting, learning how to work with wood, and even metalworking—she forged iron gates installed at her home. She also kept up her charitable work, joining a nursing association and helping feed and clothe local impoverished families. The two went through a protracted and bitter divorce in the early 1900s, during which time Willy suffered a stroke. When he died, before the divorce was finalized, Daisy discovered that he’d left everything to his mistress. With the support of Low’s enraged sisters, Daisy contested the will—and they eventually won—but the effort was expensive and took its toll. She never married again. Juliette officiates a Girl Scout. In 1911, however, she met a kindred spirit in Sir Robert Baden-Powell, who had recently formed an outdoor leadership program for boys. Daisy was thrilled by the idea of the Boy Scouts, which emphasized preparedness and fun. Robert’s sister, Agnes, had started an offshoot for girls called the Girl Guides and by that summer, Daisy had formed her own Girl Guides troop in Scotland. Daisy was so energized she returned home to Savannah, and on March 12, 1912, she registered the first troop of 18 Girl Guides. Her first Guide was her niece and namesake, Margaret “Daisy Doots” Gordon. 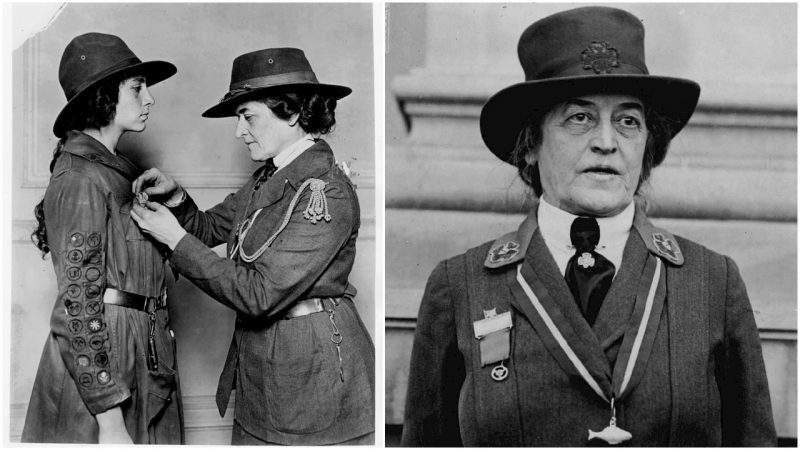 Juliette Gordon Low, then 51 years old, used her own wealth and connections to promote the Girl Scouts, and the organization quickly became popular. From the beginning, she sought to include all income levels (and eventually all races). On part of Low’s land in Savannah, girls could play tennis or the new sport of basketball. Like their Boy Scout counterparts, they learned how to pitch a tent, identify edible mushrooms, and build a fire with found wood. Early “badges” that girls earned included homemaking skills expected of that era, such as cooking, preserving, and sewing. But Low also made sure girls learned skills to help them look after themselves: typing, telegraph skills, farming skills. Since that first Girl Guide meeting, more than 50 million girls have become Girl Scouts, including many who’ve gone on to forge their own paths, a legacy Low would love.